Doctor Who: Revisiting A CHRISTMAS CAROL | Warped Factor - Words in the Key of Geek. Tony Fyler jumps the shark. Matt Smith’s first season was very hit or miss. The Beast Below was below par storytelling; Victory of the Daleks brought CBBC Daleks and the second story in a row where the Doctor needed to be saved by his companion. Vampires in Venice had dodgy fish-creature CGI, and The Hungry Earth/Cold Blood was a disappointing Silurian epic. Vincent and the Doctor (I know I’m in a minority of one on this) had another disappointing monster and a Doctor who seemed to be trying too hard. And the two-part finale could have been largely plotted by a roleplaying eight-year-old, with its alliance of enemies and rule-breaking escape. So while some people took him immediately to their hearts, and while Smith himself did good work in stories like The Eleventh hour, Vampires in Venice and the Angels double, many people approached his first Christmas Special with a degree of trepidation. In its essence, A Christmas Carol is plagiarism plain and simple. 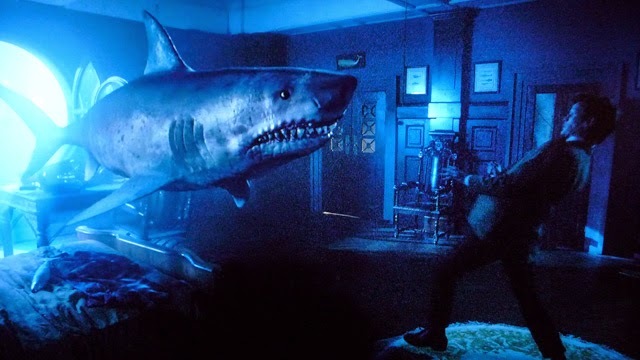 It’s Scrooge, but done by the Doctor Who team – which of course means flying sharks that respond to song, and beggaring about with the timestream to change the miser’s mind. But once you accept that A Christmas Carol really is A Christmas Carol, there’s so much to delight that the lifting of the core plot entirely from one of literature’s finest seems like small satsumas. The pre-credits sequence is jusssst a little hokey, with the Ponds on an interstellar honeymoon, about to crash into the surface of a planet. But if nothing else it does its job – it sets up the dramatic tension and brings the Doctor into the picture as would-be rescuer. Really though it’s when that voice-over begins that A Christmas Carol really starts to sing. Michael Gambon is a pitch-perfect space-miser as Old Kazran, all but personally grinding the noses of the poor into the dirt. Then bam! 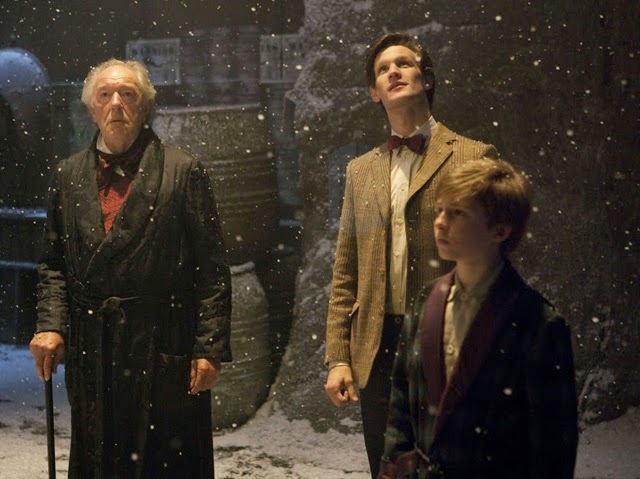 If you’d worried that the Smith boy wasn’t going to be able to carry a Christmas Special, your doubts are almost certain to have been allayed by the Doctor’s entrance and very long opening scene with Kazran. We love a Doctor who sees a chimney and whose brain thinks ‘What the hell?’ – it’s Matt Smith’s version of Tennant’s ‘big red threatening button,’ only much more fun. Jeff Santa, a big machine with buttons and levers and Kazran’s inability to hit the child. It’s a delicious, telling moment that the Doctor sees that, looks around the room and works the miser out in a handful of heartbeats – it’s real ‘smartest man in the room’ stuff, and it’s the Eleventh Doctor really feeling like the Doctor for [controversial opinion alert] the first time in the show. It’s also telling that understanding Kazran Sardick means the Doctor has a difficult life. He can’t bully his way to getting Amy and Rory safely through the shark-infested clouds. He can’t sweet-talk his way to it either, and, thanks to Kazran’s isomorphic controls, neither can he sonic his way to the result he wants. The only course of action left open to him is to get Kazran Sardick, who holds all the cards, to change his mind. What follows is relatively merciless – the Time Lord not so much victorious as desperate, forgetting everything he usually says about not interfering in the lives of others, and consciously meddling in Kazran’s timeline, to make his mindset be different right at the point the Doctor needs him to be a nicer person. 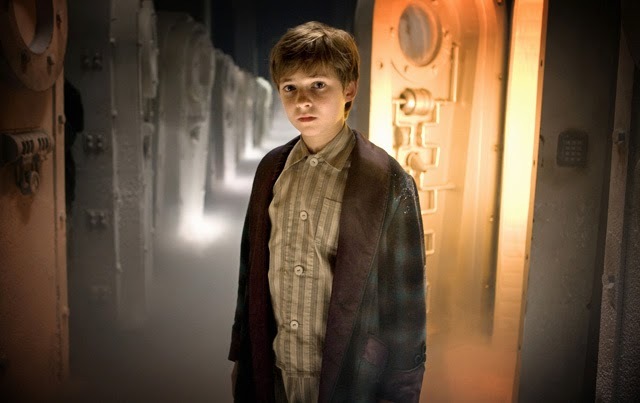 Going to visit Young Kazran, we see one of the real strengths of the Eleventh Doctor – put him in a room with a child and everything gels, everything fits. The Eleventh Doctor, more than any other, is a good wizard in a fairy tale. This is perhaps understandable, given that the first face his face saw was that of a child, his first conversations were with a child. With Young Kazran, he is the Anti-Poppins, and Kazran is revealed to be a boy in fear of his father’s beatings, and isolated by wealth and by not having an experience all his peers have had. He’s interested in the cloud-fish, and when they’re attacked by the shark, Kazran, with the air of children everywhere who bring nearly-dead chicks or mice home to nurture and revive, is determined to return it to the clouds, where it can heal. The Doctor respects his refusal to accept the inevitability of death, and agrees to help. The need of a cryo-pod introduces us to Abigail, and the Scrooge parallel picks up speed – she’s the woman who shows Kazran kindness, who shows him life as it could be lived, and who has a gift that can tame even the sharks of the air. Katherine Jenkins is given what could easily be a gratuitous chance to show off her song-spinning talents (let’s be clear here – she’s a singer, not an actress. Fortunately, she’s an utterly ethereal singer, and so finds a way into and through the story). 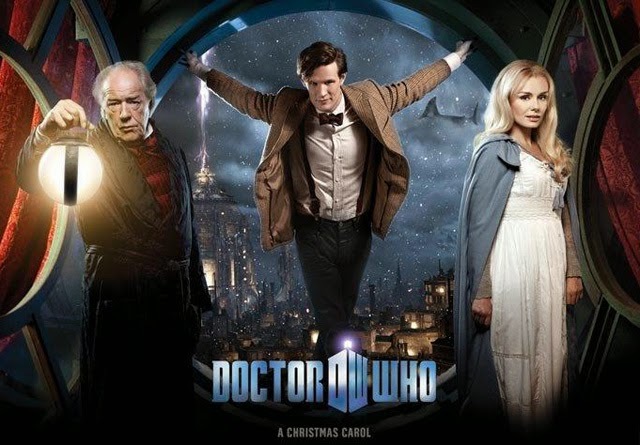 Having returned the shark to the clouds, and Abigail to her cryo-pod, the Doctor becomes part of Kazran’s life – every midwinter’s night, up pops the wizard in the box, and out comes Abigail, to have the most wonderful winter adventures. With these adventures to cling to in the face of his father’s harshness, Kazran changes. He learns how to love. The chance of redemption for him is shone into his life not by the Doctor, but by Abigail. When, as he grows into a young man, Abigail returns his affections and the two exchange their love-kiss, Kazran’s life seems set to be lived entirely out of the dark, and in the light of her radiance. She tells him the truth – as well as being security on a family loan, she’s in the cryo-pod because she suffers from a terminal illness. Every time he’s unfrozen her, she’s used a precious day of her life to be with him, and now she has just one day left. With that knowledge, Kazran chooses fear over love. Fear of the death of the woman he loves, and fear of the life it will leave him with. His refusal to accept the inevitability of death, this time, has cold consequences – he tells the Doctor not to come back, and can never bring himself to unfreeze Abigail for that one last night. And in choosing that fear, he freezes himself. He wastes his life, embittered at a universe that would show him love and then take it away from him – and his path in the dark is set. None of which helps the plummeting Ponds or the desperate Doctor. When the miser and the Doctor confront each other again, it’s a different Kazran who rails against the Time Lord’s interference, giving him memories he never had, showing him life and love and hope and then snuffing it out – the Doctor has become Kazran’s avatar for Fate, and not without justification. But the Doctor’s final trick – showing old, ranting Kazran to young, fearing-his-father Kazran is shocking, and brings the story full circle: ultimately the man who could not hit a child needs to be kind to the child inside himself, and rediscover his joy. He unfreezes Abigail and they enjoy their final night together, riding a carriage pulled by their shark, into a snow-filled sky.